0.1 Want to truly go local on Gran Canaria? Attend one of the native celebrations held throughout the year in municipalities across the island. Like Firgas’ Fiesta del Berro 2016. Want to truly go local on Gran Canaria? Attend one of the native celebrations held throughout the year in municipalities across the island. Like Firgas’ Fiesta del Berro 2016. We were recently contacted by a couple heading over to Gran Canaria from London for the weekend. They wanted us to suggest something unique for them to do on the island. With little hesitation, we recommended they check out Firgas’ Fiesta del Berro 2016 . 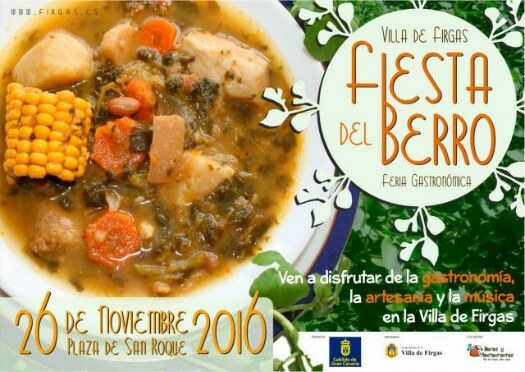 The Fiesta del Berro 2016 is predominately a gastronomic fair. When the temperature drops on Gran Canaria, as in below 20 degrees centigrade, the locals like to warm up with a hearty bowl of potaje de berros (watercress stew). These greens grows well in Firgas as the municipality is sunny but cool with plenty of shady spots provided by the copious fauna. You’ll learn how to make this Canarian staple at the Fiesta del Berro’s live cooking demonstrations. And taste this substantial dish and other native culinary faves at the various street food stalls. What’s more, you can purchase traditional crafts from the artisans who made them. La Parranda de Teror, Tenderete veterans, will introduce you to the world of Canarian folk music. Also on the bill are poppy rockers Overbooking who have covered the likes of Dire Straits and Spanish superstar Raphael. And not forgetting teen talent in the form of the Banda Juvenil de Firgas. Firgas is one of the 10 northerly municipalites belonging to the Marca Norte de Gran Canaria. The municipal capital’s an hour’s drive from Playa del Inglés and under 30 minutes from Las Palmas de Gran Canaria. Head to the centre of town and the Plaza de San Roque to catch all the action. 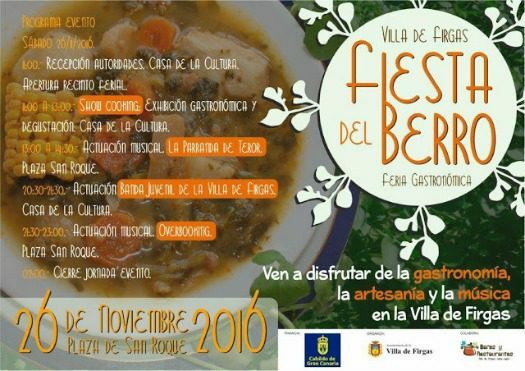 This year’s Fiesta del Berro takes place on Saturday 26th November. Kick-off is at 11:00am but this all-dayer of an event goes on into two o’ clock the following morning. See you there?